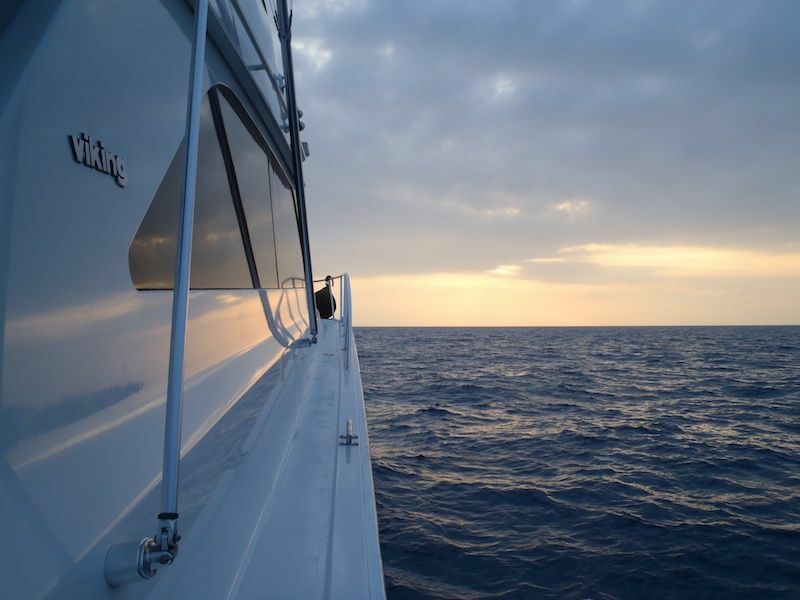 After a rather busy period at work I think I have a few moments to sit down and write about my experience aboard the 55 foot Viking 'Spartacus' while they fished the 2010 Billfish Challenge. 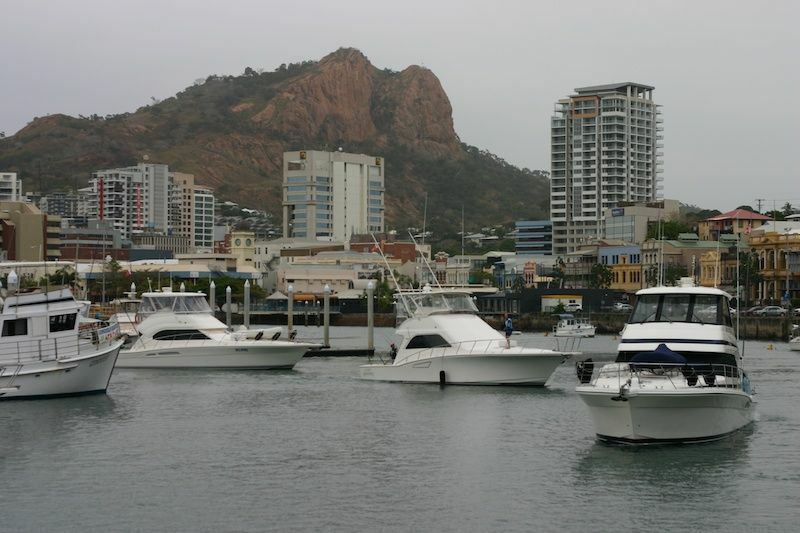 This was a big event for the Townsville Game Fishing Club with over 30 boats entering the competition. The smallest boat of the fleet was a Cruise Craft outsider 575, similar to my own. And the biggest was a 56' O'Brian. The event began early Saturday morning with the traditional blessing of the fleet and then a sail past to the start line outside the harbour. The sail past was a spectacular sight with millions of dollars of boatings best cruising slowly past the Coast Guard. There were quite a few people lining the rock wall for the spectacle. 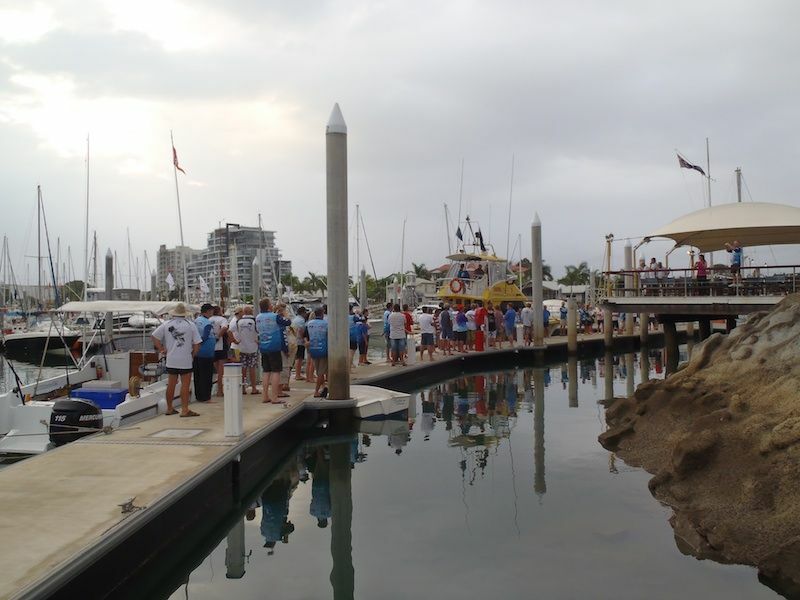 Then the boats lined up for the 'shotgun' start to the event. Most boats headed south to the normally prolific Bowling Green Bay billfish grounds. But Spartacus and a few other boats headed north for some warm water where baitfish should be holding. The fist day didn't hold a whole lot of action for our boat. We trolled skipping gar and swimming mullet in a spread of 5 lines out the back of the boat. The most action we saw for the day was a school of small tuna that held up our hopes of a feeding billfish and a large Spanish Mackerel that cleaned up a queenfish being pulled behind a teaser. If fact there was more action from the crew throwing there guts up for too many drinks at the meet and greet the night before than from the fish themselves! By late in the afternoon we were even trolling the edges of the reef in search of anything that would get the ratchet on one of the reels screaming. But it wasn't our day. We then anchored in the shelter of a lagoon on one of the reefs and settled down to a beautiful roast dinner. Next morning we awoke to near perfect conditions on the water. The skipper had a choice to make, head back and troll the 30m line where there were a few sailfish raised by other boats the day before, or head to the shelf and go looking for bigger fish! It was an easy decision, despite being a bit worried about what might hook up on the 6kg line being fishing for the competition, the prospect of big fish off the shelf was too tempting. 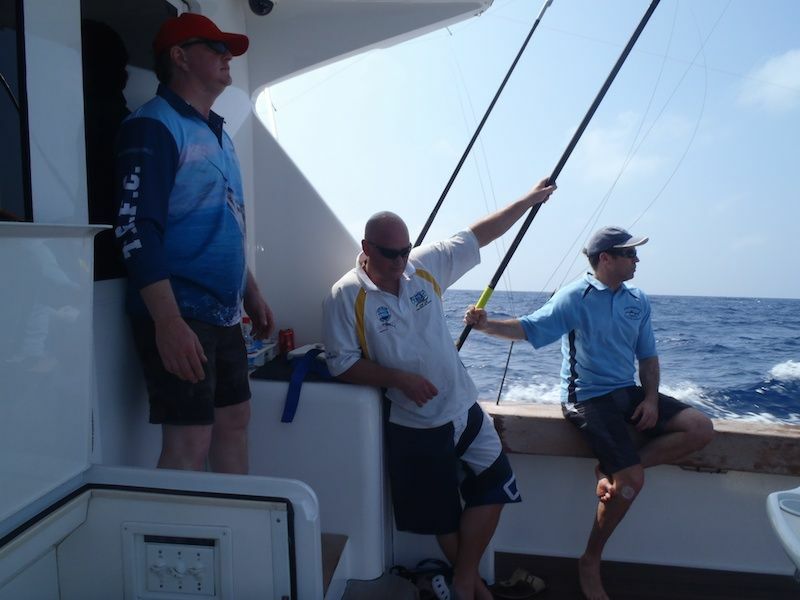 We steamed out at 25knots until the start time when a spread of lures were chosen. It was decided to troll lures and keep the speed up around 8 or 9 knots to try and cover some ground and hopefully find the fish. The troll began around Urchin shoal, and it wasn't long before on the reels was screaming. But it ended quickly with a 'crack' as the line broke at the reel. The drag had been set too high. The lures were again set and the drags were all backed off on the reels. Again it wasn't long before another reel was screaming. This time a Sail leapt free of the water as line disappeared from the reel. With the lines quickly cleared the skipper was soon backing down on the fish. It was a short fight, maybe only 10mins, and soon the tag was placed. Cheers of joy and celebration and the fish is brought aboard for a quick photo. Lines were quickly re-set and we were off again. Hopes were now high as we had had two strikes and one landed in only minutes. We kept following our path for the shelf. As we passed over another shoal there was a show of a couple of fish on the sounder. Then moments later, bang reels screaming. Then bang again and it was a double hookup. With nothing jumping our suspicions turned to Tuna. And with the fish circling deep our suspicions were soon confirmed. 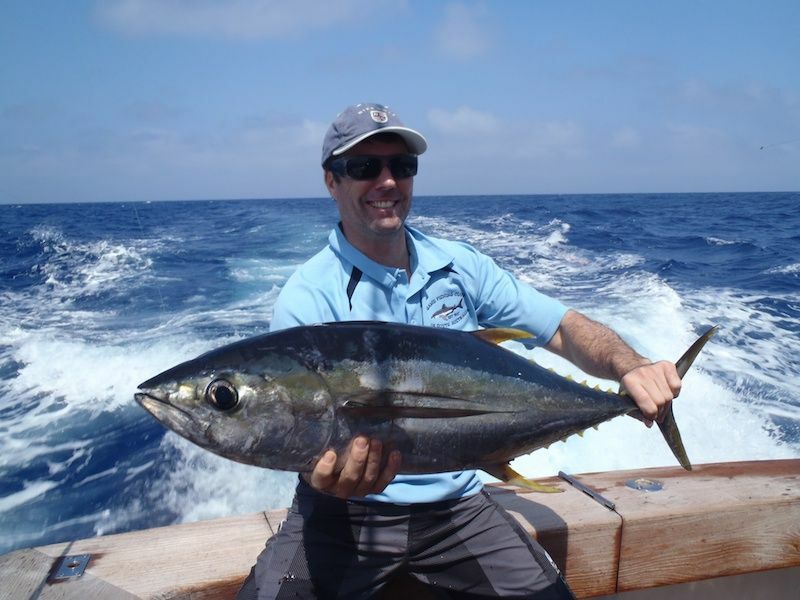 It amazes me how quickly these guys knock over good fish on 6kg line, soon the pair of nice school Yellowfin Tuna were in esky. As we approached the shelf the water depth quickly increased, and it wasn't long and we were trolling in 150-200m of water. The colour of the water out here is amazing, simply too beautiful to describe. Its even bluer than around the reef! It just screams BIG FISH. We were not on the shelf for long when a big fish was spotted up bashing on of teasers. The guys tried to pull in the teaser and feed back a gar, but one of the outriggers was smashed. The line peeled form the reel at amazing speed, and while the crew was clearing lines the angler was yelling about running out of line. 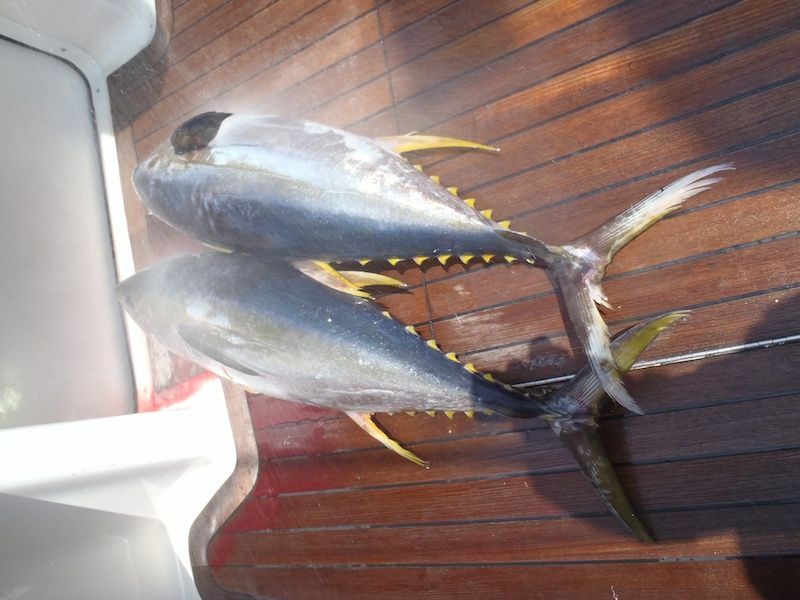 Composures were regained and skipper backed down hard on the fish. While we were guessing as to the species the deckie too a look at the teaser it had been climbing all over. The leader was torn to shreds. We were now thinking Wahoo, and with a mono leader things didn't look too good. But it hadn't bitten of immediately, so maybe luck would be on our side. 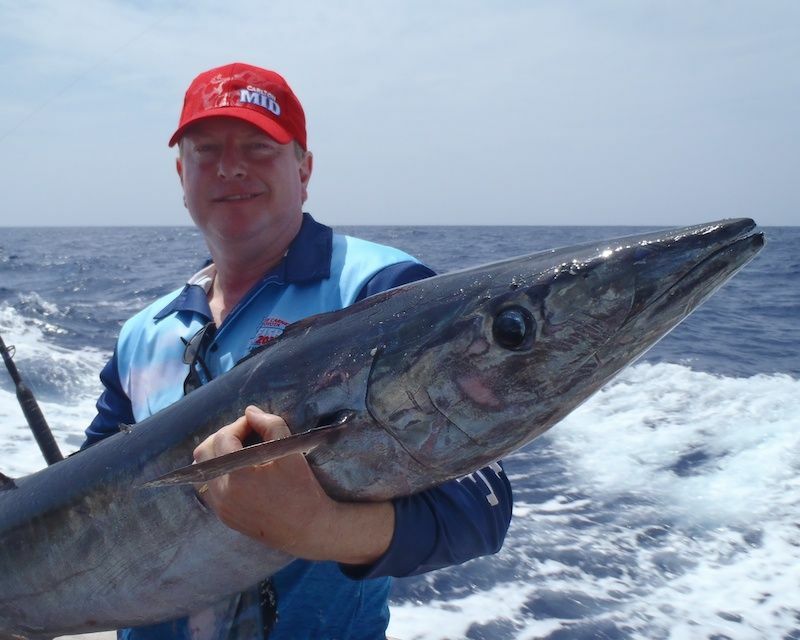 After a solid fight a Wahoo of almost 30kg was just out of gaffing range. 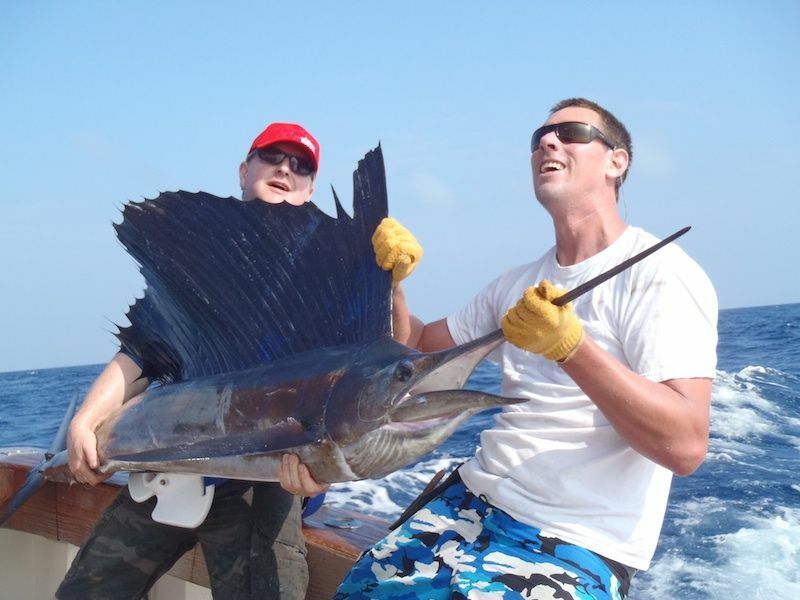 The fish had been jagged in the side, allowing the angler to land the fish without being bitten off. A lucky catch, but a dam fine one on 6kg! The next strike was another screaming run in 150m of water. It didn't last long before the leader was bitten through. Anther Wahoo was suspected. Except for a small striped tuna and an airborne attack from a Mackerel, the rest of the day was pretty quiet. But it didn't matter, we had seen plenty of excitement and even tagged a sail. It was a long run home but at 25knots in a 55 foot boat and glass out conditions it doesn't matter. A few celebratory drinks later and were were back in the marina re-fueling. An estimated 2,500lts for the 2 days on the water! I'm glad I was just along for the ride! A big thank you to Ralph and the crew for having me on board, it was an amazing experience. 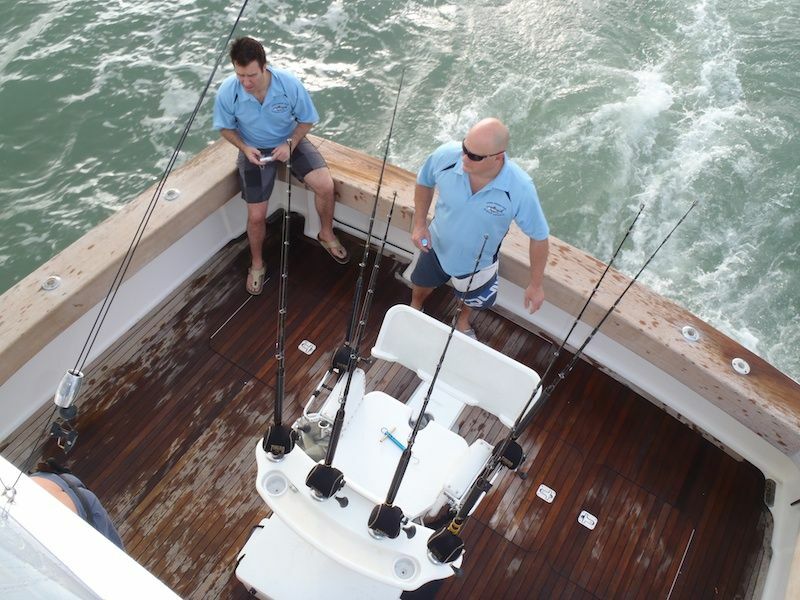 I hope you guys have some success up off Lizard Island in the Heavy Tackle Tournament. I learned a lot while on this trip, and I am keen to organise a day out with a selection of trailer boats specifically chasing billfish. Its not something I want to get into, just have to give it a go once for the experience. It is indeed true what they say about game fishing, lots of nothing punctuated by moments of sheer chaos! Spring into Summer Boat Expo!